In an industry where customer is the king, the only way businesses can stay ahead of the curve is by adapting to every changing customer expectations. This includes letting the customers select the way they want to get in touch with you. Though accommodating multi-channel capabilities allow your business to meet this need, but is it enough? Let’s delve deep and try to ponder on the true essence of these words by understanding the basic difference between multi-channel and omni-channel support. What’s the difference between multi-channel and omni-channel customer support? What is a support channel? It is the medium through which you interact with your customers. Some of the most prominent ones include telephone, live chat, social media, email, video, self-service knowledge bases and forums. To put it in simple words, multi-channel support is nothing but providing support to customers across more than one channel. This means that a company offering multi-channel support provides multiple avenues through which customers can reach them. But in majority of cases, most of these channels works in silos and are rarely connected with one another. What is omni-channel customer support? Omni-channel customer support overcomes the drawback of multi-channel support and takes support to the next level. It does so, essentially by integrating various channels such as text, email, social media and instant messaging to provide a unified brand experience. This simply means that the customer can switch between multiple channels and yet experience the same kind and quality of service. And when you look at stats like the one published by Accenture, which states that 89% of consumers experience frustration at having to repeat their questions to multiple customer service reps, you will see the real value that omni-channel customer support provides. Why omni-channel support is imperative for long-term brand success? Yes, providing an integrated customer experience across various support channel will cost you heavily in terms of budget, resources and infrastructure. But the gains made due to this implementing will easily outweigh the costs. It is not just your business that stands to benefit from offering omni-channel support, but the customers will also walk away felling more satisfied with your services. Simplification: With omnichannel service, agents aren’t required to jump from one system to another to retrieve relevant information. All interactions occur and are stored in a single back-end system, which can be a boon when it comes to providing more personalized service. Continuous Conversation: While every organization try to resolve issues on the first contact, that’s not possible in majority of case. Perhaps the agent is not aware of that particular condition and needs some degree of offline research. Or perhaps the customer is short on time, hence disconnects the call, and finally follows-up with a chat session. With omni-channel customer support, customer don’t have to start the story over again when he interacts on a different channel. As the history of all previous interactions is readily available, hence subsequent conversations can seamlessly continue without any hick-ups. Single Source of Truth: The biggest by-product of integrating various support channels into one cohesive entity is that every customer information now lives in a single location. In simple words, this means that all service information can be stored, accessed and retrieved from one single location and the need to run individual reports from multiple systems to understand individual cases will be completed eliminated. The biggest impediment to providing exceptional omni-channel customer experience is the latest customer trend of using multiple devices to reach out to a business and yet expecting the same kind of experience on every device. The task becomes even more challenging when the consumers starts switching touchpoints in a single transaction, which is a common trend in today’s digital world. For instance, it has become a common phenomenon for a customer to search a product on his PC or laptop, use his smartphone to check prices as well as reviews, and then make a purchase using a tablet or a phone. The customer expects to see the same kind of information across all devices and they may easily get frustrated if your business doesn’t meet this need. Also, the customers crave to have the same level and quality of service regardless of how they reach out to businesses. This simply means that companies must start implementing appropriate mechanisms to ensure seamless customer service experiences across channels if they want to retain customers, uphold reputations, and expand business. Or else, unhappy customers share their poor experiences across various avenues and tarnish your brand image. Mobile is a rage nowadays. Increasing exponential number of people are using it to search for products and buy items. And naturally they seek good customer service support on these devices. But unfortunately, not many businesses are meeting these expectations. In fact, 90% of customers have raised red flags regarding their customer service experience on mobile. At a time when, 52% of customers are less inclined to do business with a company that offers poor mobile experience, this mistake can be costly. “Incorrect display/difficult to navigate,” are the two biggest red flags that customer face when it comes to providing customer support on mobile. Slow loading speed is another impediment that is putting customer off. Bottom-line: ensure that you don’t lose out on business by making your websites mobile-friendly. Social media is a great tool to provide more customized and effective customer support. However, not many brands got it right to drive home the advantage that this platform offers. 32% of customers want an answer on social media within 30 minutes of initiating the conversation and 57% of them expect the same turnaround on nights and weekends. However, the average response time for leading businesses is in the range of 157 minutes. 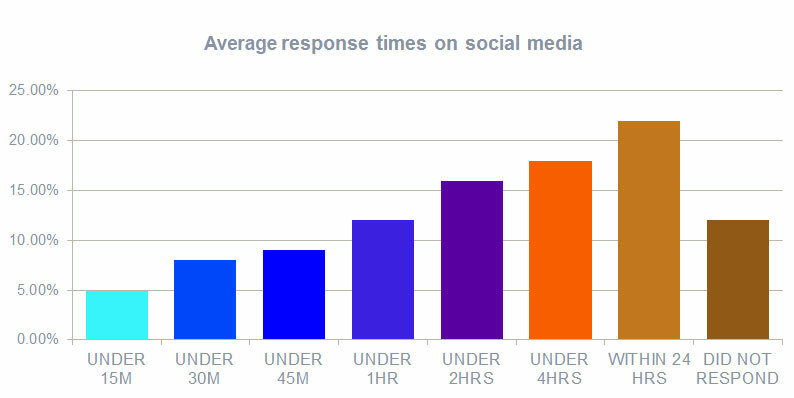 A mere 8% of businesses respond within the bracket of 30 minutes and a stunning 12% of businesses don’t respond to customer queries on social media at all. All these figures paint the sorry state of affairs related to customer service on social medial. But in doing so what businesses are failing to understand is that they are doing a costly mistake. This is because, as per recent reports, businesses that ignore social media customer service can expect a 15% increase in churn rates due to customer frustration. Bottom-line: Concentrate on social medical customer service and ensure that you meet customer expectations when it comes response time. This way you will not only reduce churn but also experience increased customer satisfaction towards your brand. It is no secret that in today’s world, an increasing number of customers want to solve their customer service issues by themselves and expect businesses to remove the hurdles involved in process. The ability to find answers and fix the problem on their own without any outside help is what they seek and if fact as per a survey, given an opportunity nearly 72% of consumers would use a business’ website to find a solution versus using other support channels. Bottom-line: Update your FAQ page, which is one of the simplest and most widely implemented self-service channel. Even though the customer is unable to find answer and requires external help, the availability of reliable information helps augment customer experience. SMS is a versatile platform that can be quickly deployed across industries. From responding to insurance claims to booking appointments to sending appointment remainders to placing to-go orders with restaurants, SMS can be customized and used for a wide variety of purposes. Also, the immediacy that it brings makes it a perfect option to respond to urgent situation. 52% of consumers would prefer the ability to access customer service via text message over others. While, as per 47% of customers, ability to access customer service via SMS would improve overall customer service satisfaction. Also, the fact that 99% of all text messages are read, makes it an highly effective channel to reach customers across demographics. Bottom-line: Start embracing this trend and leverage this platform to grow your business across industries. Live chat is a channel that is growing in popularity with each passing day. In fact, as per 63% of customers, live chat is feature that prompts them to come back to a site again and again. One of the primary reason for the rising popularity of this channel is its swiftness and convenience. There will be no hold time and customers can get answers to their queries at the time and place of their choice. Apart from being an effective channel for customer service, live chat can also do wonders when it comes to sales. In the process of helping customer overcome certain issues, agents can also enlighten customers regarding products or services that can be useful in their journey. Hence in addition to attesting bounce rates, live chat can also help customer service reps to upsell products and services to clients. But a word of caution here. Ensure that the team handling chat support is well versed and up-to-date with ins and outs of your business. Or else instead of creating positive customer experience and boosting sales, they might drive customers away by providing poor quality service. Just because it is not hot, you can discount email. Email still works and given the right impetus, it can drive sales better than other communication channels. With an effectiveness of 56%, email is undoubtedly the most effective digital marketing channel for customer retention. But, just like any other communication channel, speed is a big driver of success when it comes to providing email support. 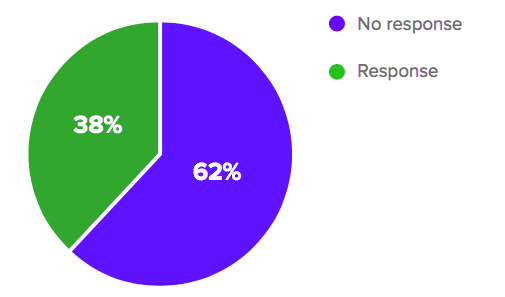 Hence falling into the bracket of 62% of companies do not respond to customer service emails is a big no-no. Bottom-line: Always provide answers to customers queries through email in a swift and accurate manner. If you are unable to provide quick answers, at least let them know that you are working toward the direction of quick resolutions and put a tab on the outflux of business. A large number of businesses put in a lot of time and effort to build an omni-channel customer support system but fail to perform the last step which is to test it out. Testing lets you have a first hand understanding of the areas that are performing and those that are lagging. And you can use these insights to improve overall performance. Providing omni-channel customer support is a forward-thinking solution to meet the ever-changing needs of today’s customers. However, don’t discount the human touch that is essential to tie everything together. Trained and experienced staff, who are well-versed with handling every type of customer concern, across every channel and deliver a positive brand image is the key ingredient to providing top-notch customer support. And this is where we can make a difference. Leveraging our large pool of customer services experts from 5 different geographies, namely, India, Philippines, Bolivia, Columbia and Argentina, we can help you drive your omni-channel presence 24X7. Leveraging our 13 years of experience in helping companies manage customer support across channels and scale new trends, we can also be the work-horse that can take care of every back-end customer support and call center needs of your business. Contact us to know more how we can make a difference to your business.